A short video clip of Bernard Katz and his team blowing glass during one very hot humid day in August. 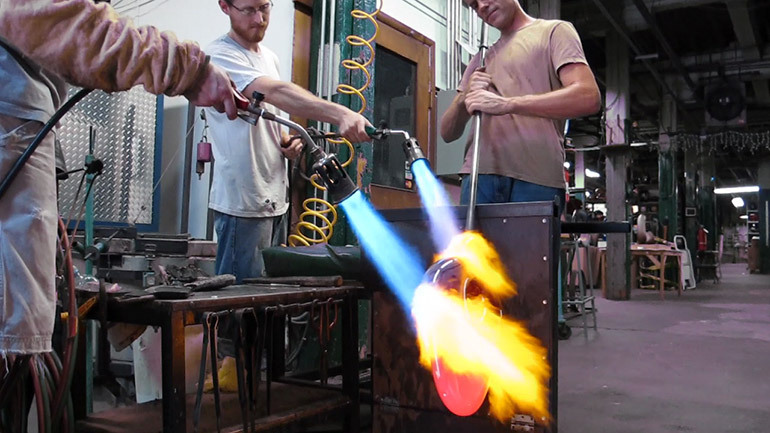 The glass blowing team uses bench torches to spot heat a piece in progress. While working on a custom glass sculpture with custom colors, using the bench torches helps keep areas of the piece hot. This can keep a glass piece from cracking if areas get too cold. We also use this torching method to add extra heat to parts of the piece we are working on. We use these bench torches extensively between trips to the glory hole when working. They are an important tool in glass blowing. A small glimpse into the day in a life at Bernard Katz Glass studio making art glass sculpture. A four part video series on this day of making custom glass sculpture.